The American Medical Billing Association states that 61% of all claim denials and 42% of all denial write-offs are due to minor, fixable errors. Checking the status of your claims in a timely manner will help you catch and correct rejections quickly so that you are not leaving any money on the table. Here are some tips on how to track your claims with Office Ally. After your claims are submitted from TheraNest to Office Ally you should receive the Claims Submission report to the email address you have on file with Office Ally. This report will verify that Office Ally has received the claims you transmitted. If you submit claims, and do not receive this report within an hour or two please let us know. This could indicate an issue with your account. Once Office Ally has processed your claims you will receive an email notification that your File Summary report is ready. This email is typically sent within 24 hours of the claims being submitted. The File Summary will review the claims submitted and let you know if they have been passed onto the payer, or failed Office Ally claims edits. You can access the File Summary Report by logging into Office Ally's website and clicking on "Download File Summary" on the bottom left hand side of the page. Each claim on the File Summary will have one of the statuses shown below. Office Ally's Inventory Reporting tool will allow you to search all of the claims you've sent Office Ally. 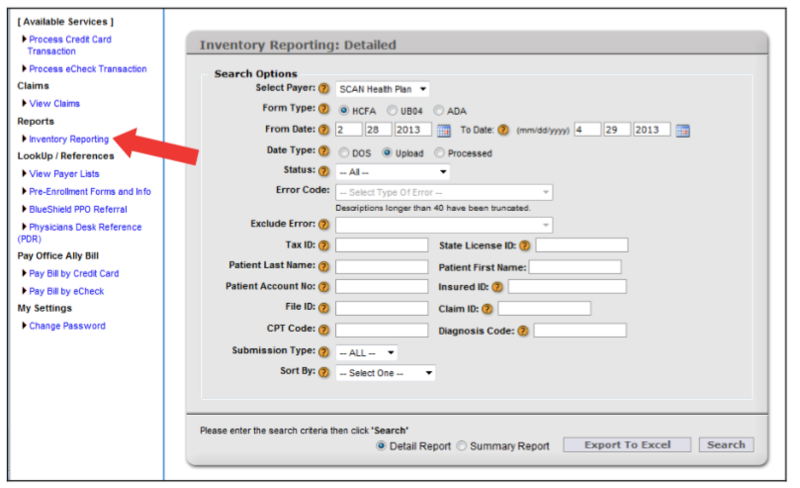 You can find this tool by clicking on "Inventory Reporting" on the left hand side of your screen while in Office Ally. If you have rejected claims, TheraNest is happy to help you troubleshoot the cause. You can complete our "Claim Research Form" linked below with the details from the File Summary Report. Then, we can advise you on how to correct the claim. After a payer has processed your claims, some are able to send back a status report. This report will let you know if your claim passed or failed the payer's processing. You will receive an emailed EDI Status Report with any status provided by the payer. Note: not all payers are able to return responses to Office Ally. If your claim passed through Office Ally, and you have not heard anything from the payer in 15-30 days you should check claim status with the payer. Many payers have websites where you can login and check claim status. If not, there should be a phone number for the claims department on the back of the client's card. Make sure to check for reports after submitting claims. It is your responsibility to make sure rejected claims get corrected and resubmitted.